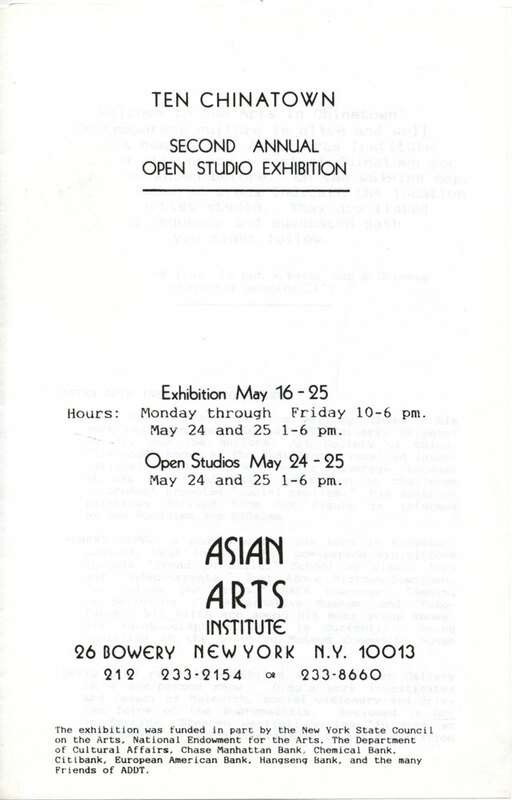 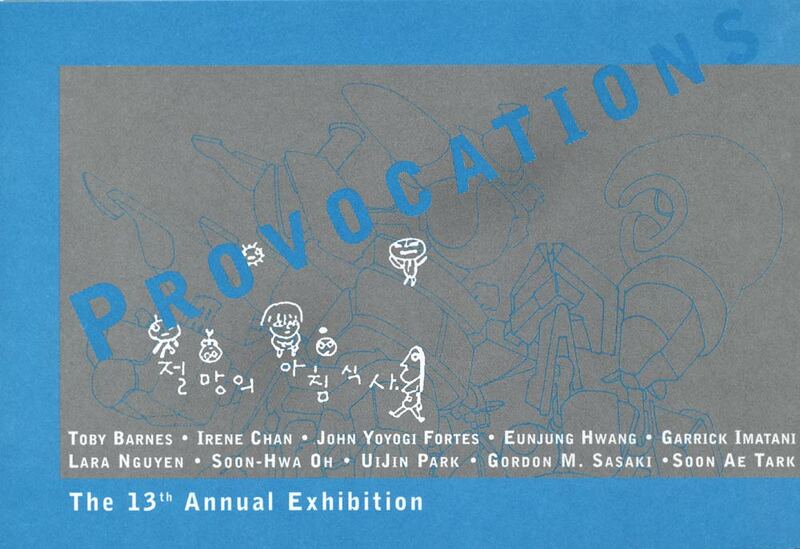 Exhibition flyer for "Provocations: The 13th Annual Exhibition" at Asian American Arts Centre, New York City, from Sep. 26-Nov. 7, 2003, with artists Toby Barnes, Irene Chan, John Yoyogi Fortes, Eunjung Hwang, Garrick Imatani, Lara Nguyen, Soon-Hwa Oh, UiJin Park, Gordon M. Sasaki, Soon Ae Tark. 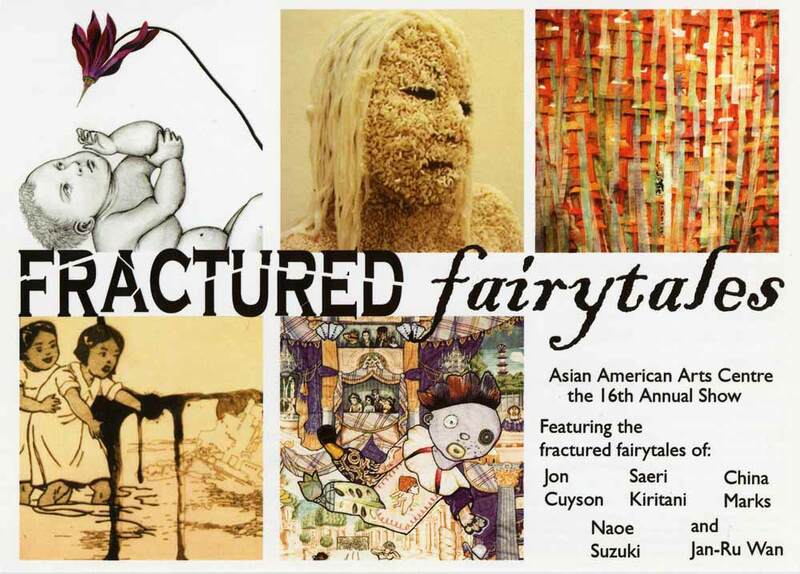 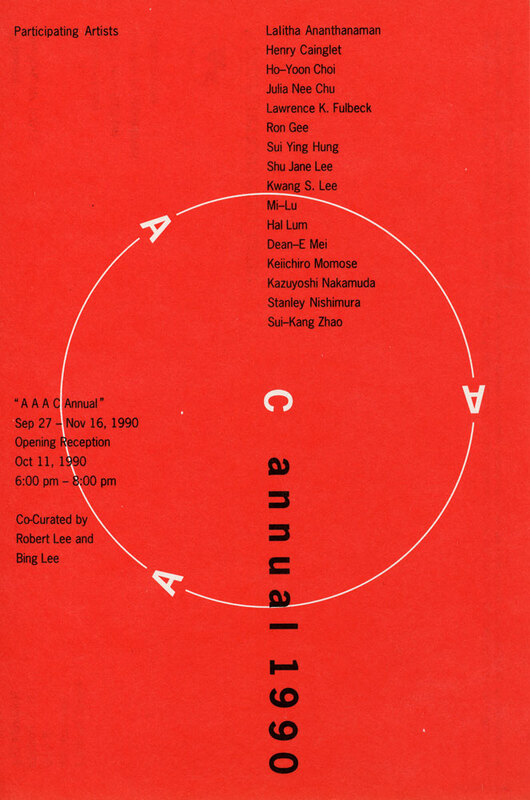 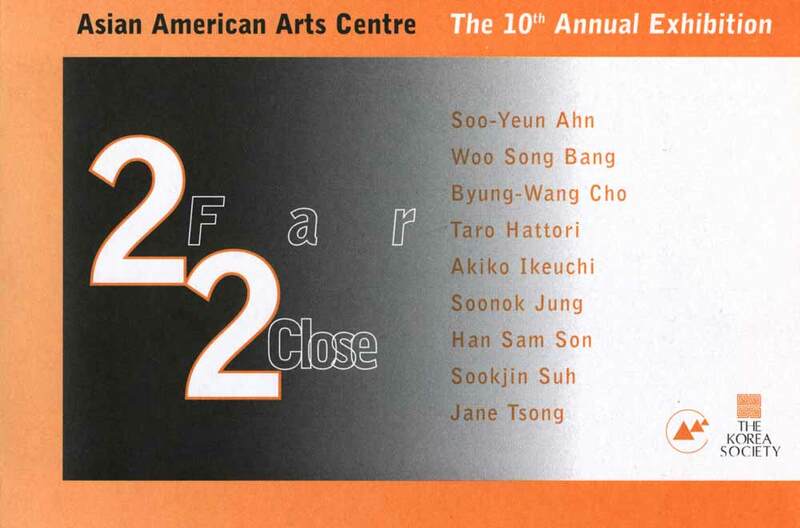 Exhibition flyer for "2 Far 2 Close: Asian American Arts Centre The 10th Annual Exhibition" at Asian American Arts Centre, New York City, from Sep. 22-Nov. 4, 2000, with artists Soo-Yeun Ahn, Woo Song Bang, Byung-Wang Cho, Taro Hattori, Akiko Ikeuchi, Soonok Jung, Han Sam Son, Sookjin Suh, Jane Tsong. 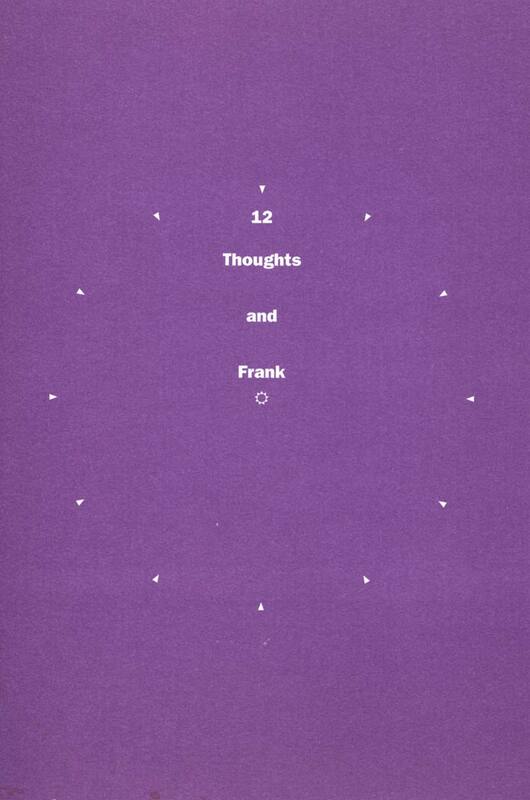 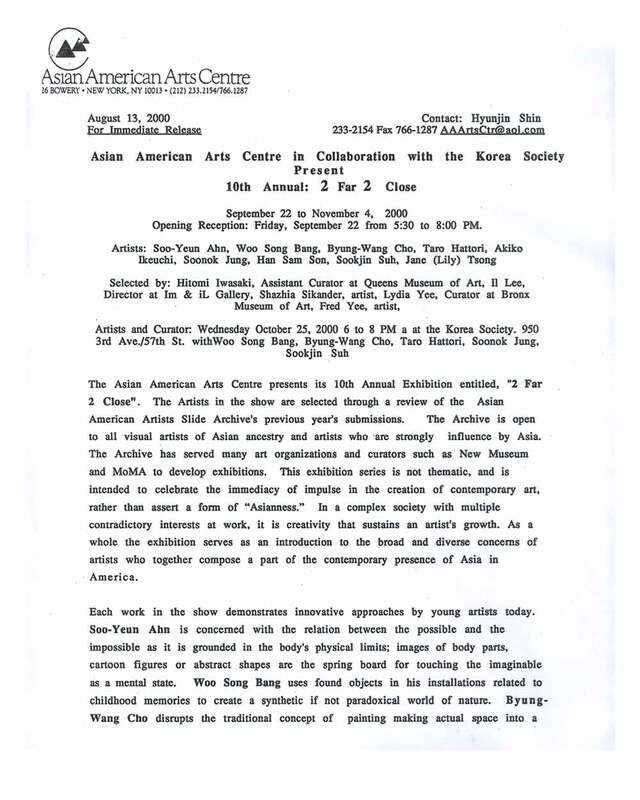 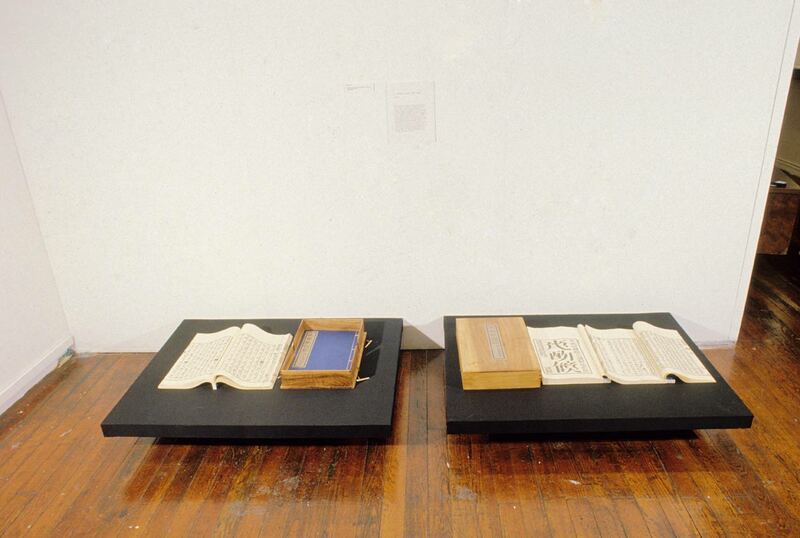 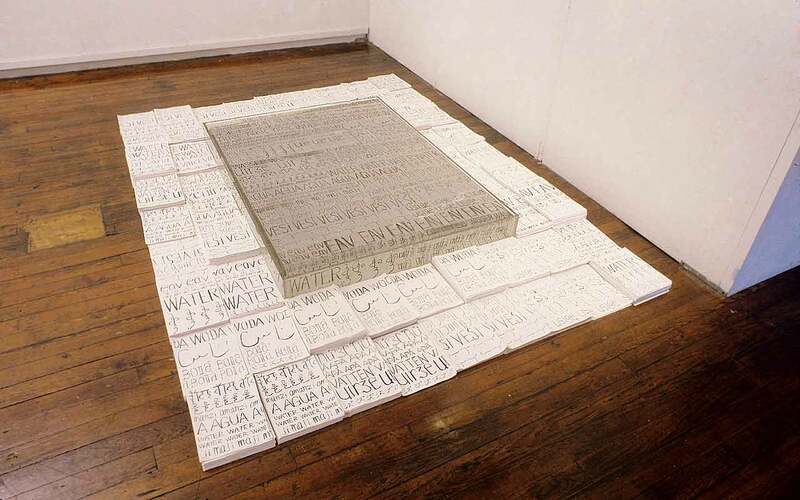 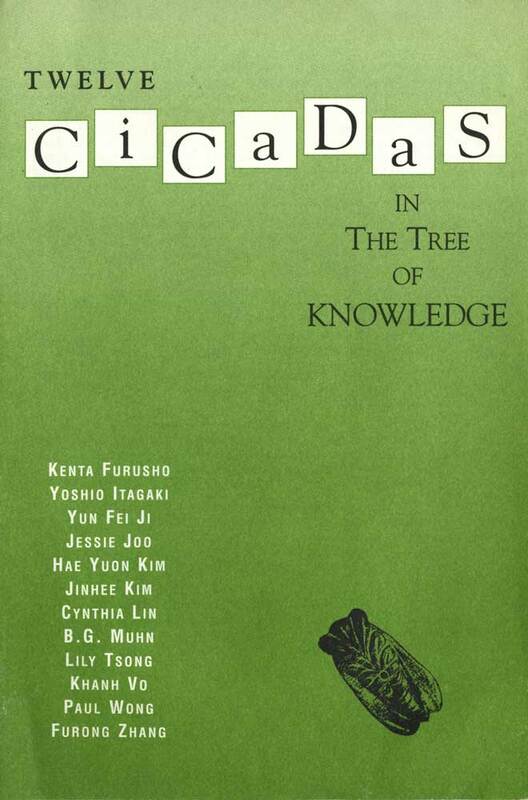 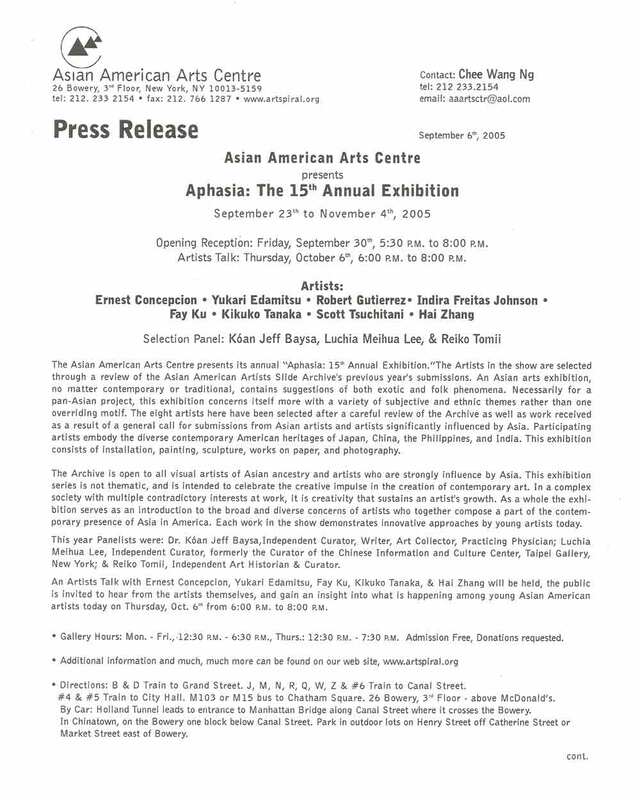 Exhibition press release for "Aphasia: the 15th Annual Exhibition" at Asian American Arts Center, New York City, from Sep 23-Nov 4, 2005 with artists Ernest Concepcion, Yukari Edamitsu, Robert Gutierrez, Indira Freitas Johnson, Fay Ku, Kikuko Tanaka, Scott Tsuchitani, Hai Zhang. 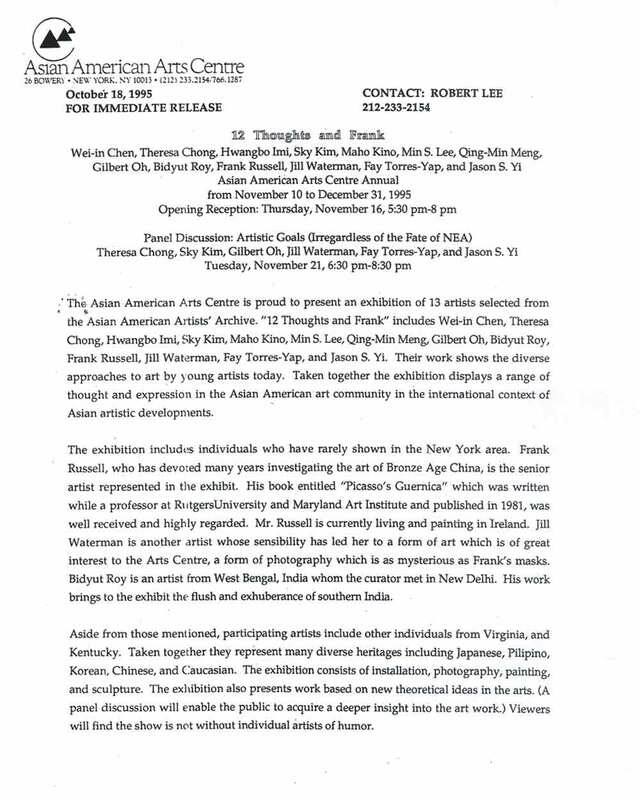 Exhibition flyer for "Butternut Ink: 14th Annual Exhibition" at Asian American Arts Centre, New York City, from Sep. 24-Nov. 5, 2004, with artists Rutherford Chang, Hirokazu Fukawa, James Jack, Evri Kwong, John Lavery, Jasmine Shwufen Lee, Jawshing Arthur Liou, Jaye Rhee, Rashmi Talpade, Jessie A. Tong, Yoichiro Yoda. 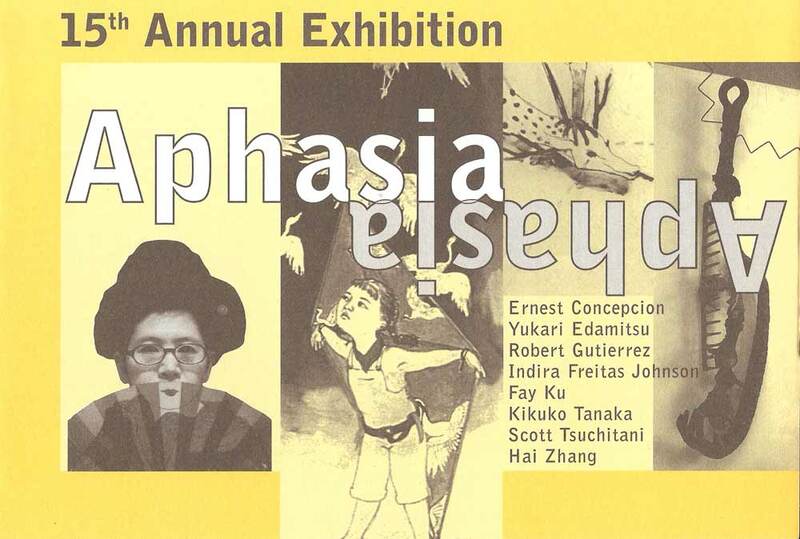 Exhibition flyer for "Aphasia: the 15th Annual Exhibition" at Asian American Arts Center, New York City, from Sep 23-Nov 4, 2005 with artists Ernest Concepcion, Yukari Edamitsu, Robert Gutierrez, Indira Freitas Johnson, Fay Ku, Kikuko Tanaka, Scott Tsuchitani, Hai Zhang. 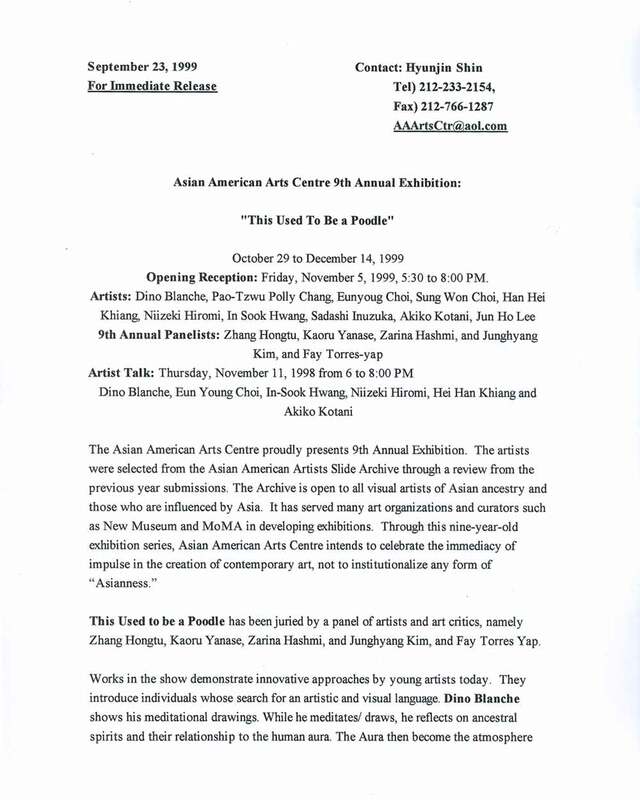 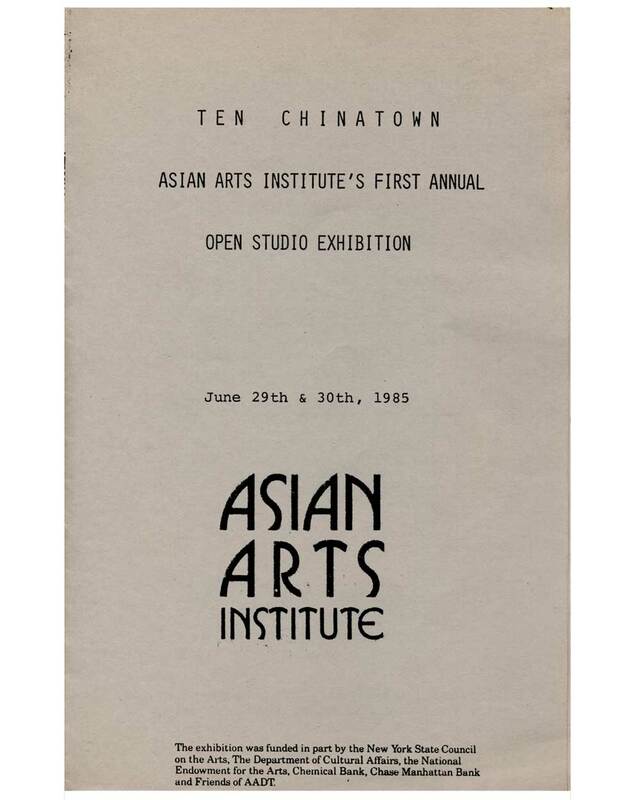 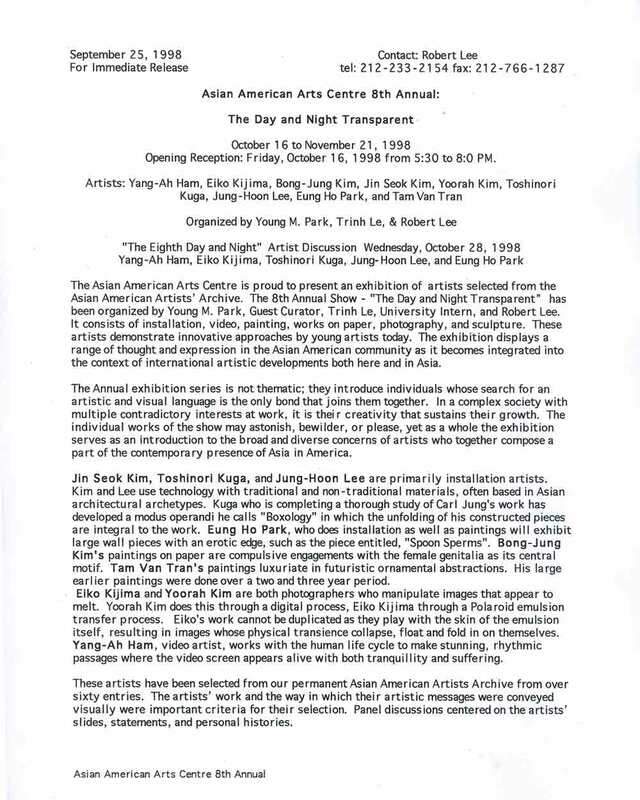 Exhibition press release for 9th Annual Exhibition "This Used To Be a Poodle" at Asian American Arts Centre, New York City, from Oct 29-Dec 14, 1999, with artists Dino Blanche, Pao-Tzu Polly Chang, Eunyoung Choi, Sung Won Choi, Hei Han Khian, Niizeki Hiromi, In Sook Hwang, Sadashi Inuzuka, Akiko Kotani, and Jun Ho Lee. 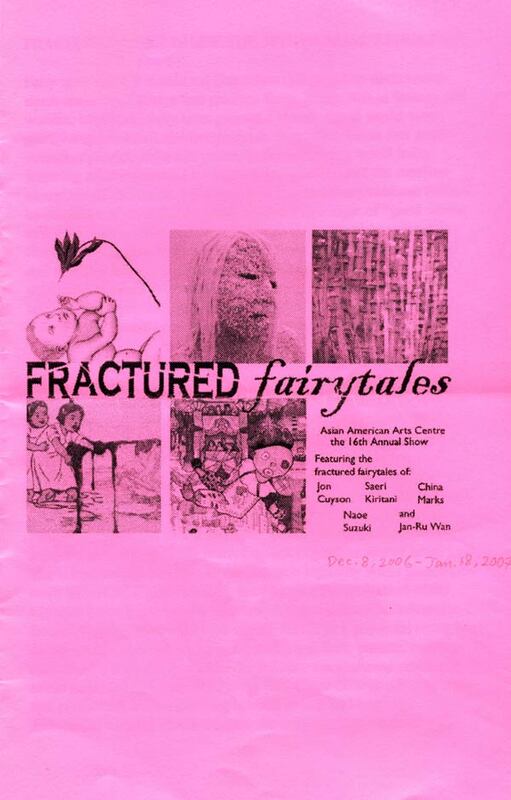 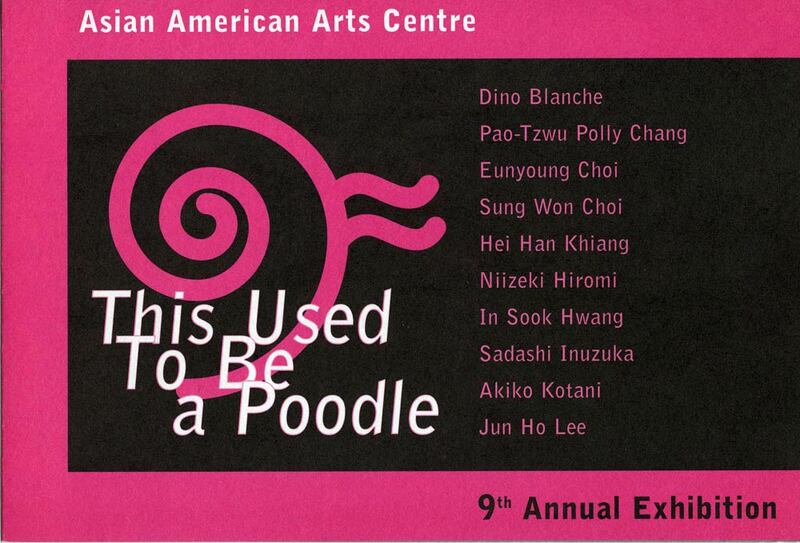 Exhibition flyer for 9th Annual Exhibition "This Used To Be a Poodle" at Asian American Arts Centre, New York City, from Oct 29-Dec 14, 1999, with artists Dino Blanche, Pao-Tzu Polly Chang, Eunyoung Choi, Sung Won Choi, Hei Han Khian, Niizeki Hiromi, In Sook Hwang, Sadashi Inuzuka, Akiko Kotani, and Jun Ho Lee.